> When Being a Lawyer Is Not for You: How to Successfully Transition into the Job of Your Dreams! Where to Turn When You Need a Job for Lawyer? "I don't want to work, I just want to bang on the drum all day." Various surveys indicate that some 70% of firm associates sometimes or frequently feel they have made a mistake in entering law. For lawyers and their careers, it seems the "drum" is banging louder and louder each day! For many lawyers the traditional career path of graduate from law school, join a good firm, practice for 35 years, make senior partner and retire, is neither possible nor desirable. As we know, the practice of law has changed dramatically. Shifting demographics, personal expectations, client demands, firm economics, lifestyle issues and so on have literally turned the profession upside down! This has had an especially significant effect on law firms, where the bulk of the profession still practices. It is no secret that this segment has been under the most pressure to reconcile interests which many say may be irreconcilable. A healthy working environment and lifestyle benefits vs. increasing client demands, extreme competition and escalating costs. Lawyers at every level and in almost every type of situation are asking themselves the same basic career questions: "Where do I want to go from here?" and, more importantly, "How do I get there?" These are expected questions. As a lawyer turned recruiter I have interviewed thousands of candidates over the years. Having gone through the process myself I am no longer surprised by the growing number of lawyers interested in new and alternative career options. However, what I do find surprising is how unprepared many lawyers remain in terms of dealing with these issues. Professionals who otherwise conduct lengthy trials and quarterback complex deals, rarely give sufficient attention to developing a personal career strategy. Although this may reflect the lack of resources in this area for lawyers, it also indicates that, while many lawyers know what they don't want to do, few have any idea of what they do want to do, particularly when it comes to pursuing alternative options outside private practice. Lawyers often react to this using the "ready, fire, aim" approach. For instance, they will meet with me and expect to be introduced to a "smorgasbord" of various interesting opportunities. They believe that, once presented with a choice of tasty options, they will know what to select. Unfortunately, it rarely works like that. When a person is hungry, everything tends to look great! In my experience the reality of this process is reflected in two basic principles: the good news and the bad news! The good news is that, as a legal recruiter, I know there are a wealth of alternative opportunities, both in and outside of law, for lawyers who are really prepared to make the change. Too numerous to list, there is an opportunity suited for every personality, skill set and interest. The bad news is that the process often requires a great deal of time, effort and commitment. For lawyers interested in a change but facing the ongoing demands of practice, family and so on, this can be overwhelming and just too high a price to pay, particularly where things "really aren't too bad." Regardless of your situation, there are ways to move past this. One way is to adjust your expectations and reduce the process to small, manageable steps. We tend to expect everything, including career change, to happen quickly. Instead, get started on the first small step and allow yourself plenty of time. It is not unusual for this process to take over a year, especially for more experienced lawyers. Once you accept this time frame, structure your activities accordingly. If things happen sooner, so much the better. 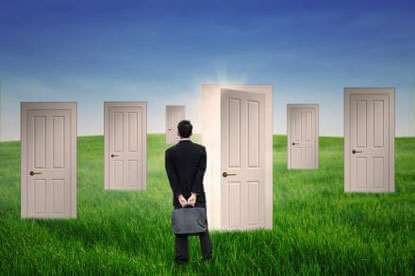 Make the threshold decision to change your situation! We all like to keep our options open, but lack of focus is a killer when it comes to career management. Make your decision, commit to your choice, then get on with it. Boss, the Plan, the Plan! Planning is tedious but critical. Sketch out a basic career plan which contains your overall career objectives, a brief sketch of your interests, skills, and abilities, your specific career goals, the action required to achieve your goals, an estimate of the resources you will require and the costs you expect to incur. And reduce your plan to writing. Nothing gets done unless it is in writing. This is the entrepreneur's motto! Approach your career search from an entrepreneur's view. Entrepreneurs create, design, initiate, seize and implement. They turn dreams into reality through action and courage. But most of all, they take absolute responsibility for their success or failure. Don't put your future in the hands of others. Take action and take charge. You Can't Steal Second by Keeping One Foot on First! Changing careers and pursuing alternatives involves substantial risk. Of all the potential obstacles to career change, this is usually the most difficult to overcome! Faced with a mortgage, kids, debt load and so on, few are willing to accept the risk of a new and exciting, but uncertain, venture, even where they know they would be much happier. This is a personal issue and everyone has their own comfort level; however, understand that you will not progress towards your career goals unless you are willing to leave the safety of first base. See The Dangers of Complacency for more information. This is one area where it pays to shed the "lone wolf" persona and get some assistance. One option is to team up with a colleague also wanting to make a change. You can share ideas, cut costs and just generally provide mutual support. Also look to headhunters, career support groups and career counselors. Legal career counselors can offer sophisticated career programs, but they may also require a significant investment. Given the importance of your career, this can be money well spent, especially for more senior lawyers. What Ya Got in the Bag, Sonny? The difference between those who find that alternative dream job and those who don't lies not in their interests or goals - they tend to be the same - but in the process they follow to achieve those goals. Lawyers have strong, transferable skills and can be excellent candidates for a broad range of business and other opportunities. However, to identify and be considered for these opportunities takes much more than simply being available and hoping it will happen. It takes effort, action and a certain degree of risk. Fortunately, these are all well within our control. See Love What You Do for more information. Non-Traditional Job Settings: The Temporary or Telecommuting Lawyer-The Best of Both Worlds or a Big Mistake? LawCrossing was really helpful. I liked the services very much and used it for more than a year. LawCrossing Fact #211: LawCrossing is exclusive.